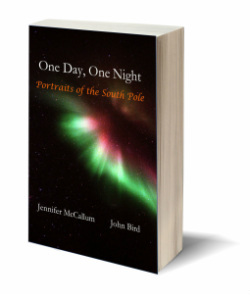 A riveting account of the challenges, the adventure, the wonder of life at the South Pole Station. In this work of narrative non-fiction, lyric prose reveals the ever-shifting physical and emotional landscapes of a year at the bottom of the world. Feel the four-month frenzied pace in the twenty-four-hour sunlight of austral summer. Find yourself bathed in perpetual darkness, frozen into the eight months of winter isolation. Discover mind-boggling science, from under the ice to the edge of the universe. Immerse yourself in land and skyscapes. Witness the first-ever winter medevac. Gawk at Polies running to the Geographic South Pole naked when the temperature reaches –101°F. It is a story of our experience of living with fifty people for a year at the bottom of the world, one of the most desolate places on Earth. Reader's Favorite: "The perfect read for adventure junkies and those eager to read about the road less traveled."